VENTURA, Calif. - "It's teaching from the roots up." 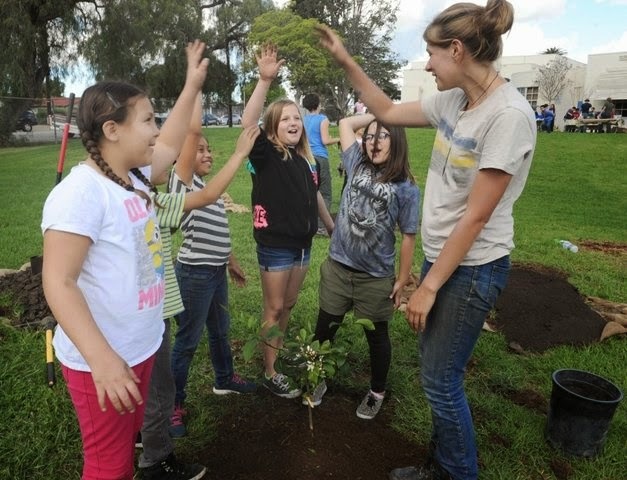 That's how instructor Deby Tygell described Monday's project of planting a fruit-tree amphitheater and raised garden beds at Ventura's Academy for Technology and Leadership at Saticoy (ATLAS). The fruits of the labor of the fourth-graders who planted apple, pomegranate, plum and other trees will eventually be added to the cafeteria's meals or sold at school-sponsored farmers markets, Tygell said. 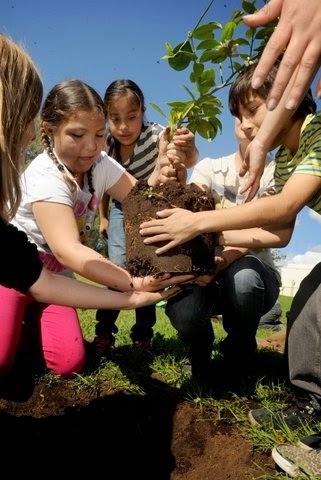 Crews from Common Vision and Treeco joined the children and Ventura Unified School District employees in planting 16 fruit trees in a semi-circle near the school. As they grow, the trees will create a natural amphitheater where teachers can conduct classes for outdoor learning. Volunteers from Captain Planet built the raised beds, readying them for soil and then vegetable and fruit seedlings. Tygell has been applying for grant money from Common Vision, Treeco, Captain Planet and other organizations as part of a comprehensive project to teach the students about horticulture and farming. "We have a safe and healthy schools program here at Ventura Unified School District where we teach sustainability, how to eat local food, and to respect where food is processed," Tygell explained. "We live in the area where Cesar Chavez was promoting service-based learning. This project teaches students social responsibility. We look at water use and other aspects of farming." David White, from Food for Thought of Ojai, also works with Captain Planet, an Atlanta-based group that allows teachers to substitute "engaging hands-on lessons in the garden for textbook-driven lessons in the classroom." 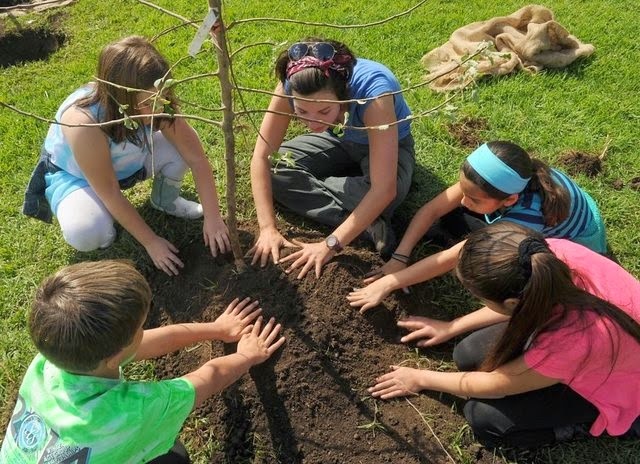 Common Vision, a California-based program, travels around the state in a painted bus, planting and maintaining fruit trees at 205 schools, according to Leo Buc, executive director. "This is a low-maintenance mode that's working really well," Buc said. "Ventura County's growing climate gives us a tremendous opportunity for scaling up the farm-to-school contacts." Also helping with the project was local soil amendment producer Agromin, which donated compost to be mixed with the soil, and Treeco, which donated two cherry trees and a banana tree. Treeco owner Edwin Sowik said he has been planting trees on the large campus for years, when the school was known as Saticoy School. He pointed to a large oak that his son grew from an acorn; it was moved from an area church years ago. ATLAS Principal Jennifer Dustin said the project dovetails perfectly into the magnet school's mission of emphasizing technology and promoting leadership. "Our goal is to find the leader in every child," she said. "Some children are leaders in gardening, dancing, cooking and music. Others are leaders in public speaking and organizing." She said the idea of selling some of the excess produce in a small farmers market would offer teaching opportunities in sales, marketing, math and other fields. As one of Common Vision's instructors, Tom Walther, of Portland, explained to a small group of fourth-graders how apple trees are grafted using heartier root stock to support tastier apple-bearing branches. The students listened as they mixed compost into topsoil, before planting the tree. Fourth-grader Jon Carrera, 9, explained that he has helped his family plant trees in their yard. "I knew that it would be a lot of work," he said. Madison Jourdain, 9, another fourth-grader, said she enjoyed working outside. "It think it's cool," she said. "We get to use dirt and get our hands dirty."